The Husqvarna Nuda 900 is arguably the firms first serious road bike. Using a development of BMW's F800 parallel twin engine, the Nuda promises an exciting, fun-packed, street future. But how does it measure up? 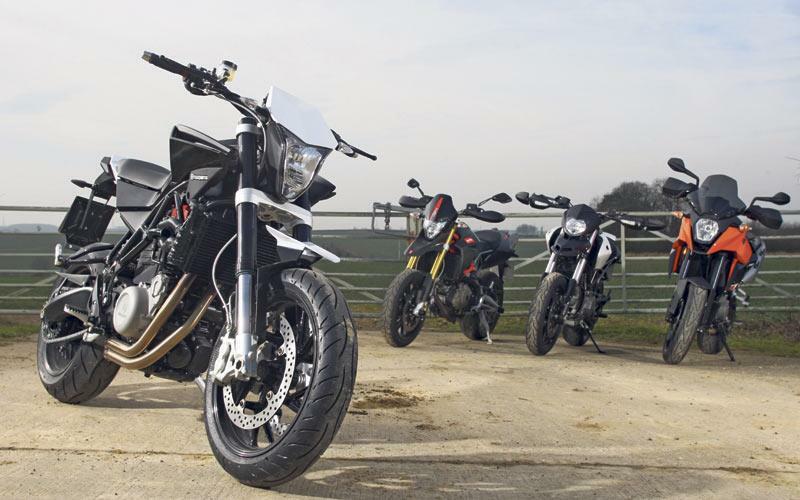 We pitted the new Husqvarna against its closest competition - the Aprilia Dorsoduro 750 Factory, Ducati Hypermotard 796 and KTM 990 SMT - on British roads to find the king of the 'street moto' category. Despite a common theme, each manufacturer has approached it in a different way and the only thing that really links these four bikes is the use of flat bars and long-travel suspension. Brakes Front: Twin 2x320mm discs with Brembo foru-piston radial calipers. Rear: Single 265mm disc with single-piston caliper Front: Twin 320mm wave discs with Brembo four-piston radial calipers. Rear: Single 240mm wave disc with single-piston caliper Front: Twin 305mm discs with Brembo four-piston radial calipers. Rear: Single 245mm disc with twin-piston caliper Front: Twin 305mm discs with Brembo four-piston radial calipers, Bosch ABS. The Dorsoduro Factory is the most 'supermoto' and aggresive in its looks, but despite the clean rear end with its neat underseat pipes and smart red frame, the carbon panels let the bike down. The Hypermotard look has been around for a while now and Pierre Terblanche's take on a supermoto has been considerably better received than his idea of a sportsbike (the 999). The Husqvarna is the newest bike in the test and as such you would expect a fresh look, but the Nuda is completely unique. Having moved the SMT more towards touring than supermoto, it is no surprise that the 990 looks bulky in comparison to the other bikes on test. To read the full group test, pick up a copy of the February 22 issue of MCN.